The manual transmission system of a vehicle works a bit differently than an automatic transmission system. If you look at the floor of the driver’s seat in a manual transmission vehicle, you will notice there are three different foot pedals on the floor instead of two. There are the gas pedal and brake pedal on the right side and the clutch pedal on the left side. The clutch pedal is the control mechanism which deactivates or activates the clutch component. A clutch is what allows the wheels and engine to be connected. If you step on the clutch pedal, the wheels and engine become disconnected from each other. The clutch release bearing helps make this disconnection possible. Now you may wonder why you’d ever want to release the engine from the wheels. Think about when you slow down to a complete stop at a stop light or stop line. Even though your wheels are not moving, your engine is still running. If you don’t disconnect the running engine from the wheels as you slow down to a stop, then your engine will shut off. That way, your engine can continue spinning while your wheels stay motionless. As you step on the brake pedal, the clutch release bearing moves toward the flywheel. The nearby pressure plate has release fingers which then get pushed into the strong spring, resulting in the wheels and engine becoming disconnected. 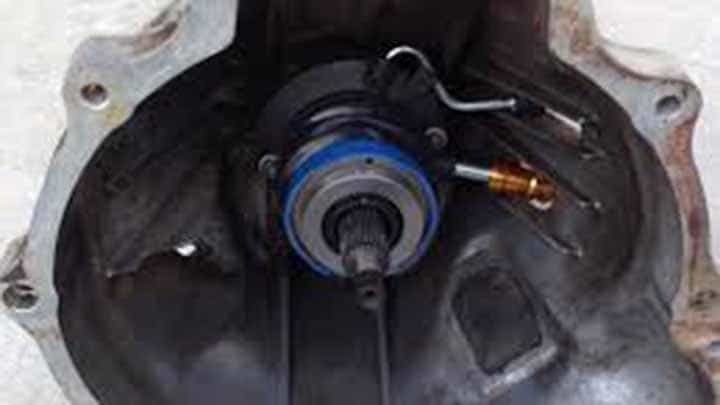 If the clutch release bearing were to get worn out, damaged, or malfunction in some way, then it would disrupt the entire disconnection process. This will result in your car engine shutting off because of your inability to disengage the clutch. You will notice when you have a bad clutch release bearing. It will have a severe impact on your driving ability, among other things. You need to be aware of the symptoms of a bad clutch release bearing so that you can stop the problem from escalating into something worse. Below are the top 5 symptoms of a bad clutch release bearing. 1) Rattling Sounds – If you hear any strange rattling sounds coming from the clutch area, then you might have a bad clutch release bearing. These sounds are made when the bearing’s rollers are too far apart from each other. They are supposed to be close together under normal circumstances. However, as the bearings get used repeatedly over the years and become more worn out, the rollers start to separate. In addition to rattling sounds, there may be other sounds too, such as growling or squealing sounds. They will get a lot worse when you put pressure on the clutch pedal with your foot. 2) Shifting Problems – If your clutch release bearing works fine, then your shifting should work smoothly. But if you have a bad clutch release bearing, then you will start having more difficulty shifting gears. This problem will normally occur after you first hear the strange rattling sounds. If you’ve let the clutch release bearing problem get to this point, you should not wait any longer. Get the component replaced immediately. You need to be able to shift your vehicle flawlessly as you drive or else, you’re susceptible to accidents and personal injuries. 3) Clutch Stiffness – Does the clutch pedal feel stiff when you put your foot on it? This could be a sign that your clutch release bearing has lots its lubrication properties because of old age or excessive use. Without these lubrication properties available for the clutch release bearing, the clutch will get much stiffer and more difficult to disengage. This is a clear safety hazard which must be addressed before you drive the vehicle anywhere else. Take your vehicle to the mechanic as soon as you notice just a little bit of stiffness in the clutch. 4) Vibrations in the Clutch Pedal – The clutch pedal should feel smooth and steady when things are normal. But if you find the clutch pedal to be vibrating as you press down on it, then you probably have a bad clutch release bearing. As it gets more worn out, it will have more trouble pushing the pressure plate toward the spring. During this situation, pulsations will flow into the clutch pedal. These are the vibrations that you feel coming into your foot. 5) Spongy Pedal – In addition to vibrations in the clutch pedal, you may experience a spongy clutch pedal too. The pedal should never feel too loose or too firm. If it is loose, then you could have a bad clutch release bearing. It is even worse if the clutch pedal goes all the way to the floor without much effort. Of course, there could be some other problems with the transmission and clutch to make this problem occur. Only a qualified mechanic can diagnose the problem and determine what it really is. The clutch release bearing certainly isn’t the cheapest component to replace in a vehicle. The parts costs alone will be between $80 and $500, depending on the make and model of your vehicle. But the bigger expense will be for the labor costs because it is not easy for an auto mechanic to access the clutch area and replace the bearing. The labor costs could be anywhere from $300 all the way up to $700. In total, you could be paying a minimum of $380 to a maximum of $1,200. There will be taxes and fees added onto this price too.